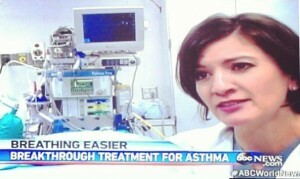 Our own Dr. Lisa Kopas leads the way in a new technology for severe asthma. Bronchial Thermoplasty is giving hope to many asthmatics allowing them to lead active lives. Dr. Kopas was featured on ABC World News with David Muir in a story about the exciting new treatment for asthma.” also lets link the new 5 year data with blurb: “Bronchial Thermoplasty proves to have effectiveness lasting 5 years. Call our asthma hotline (713-255-4010) to see if Bronchial Thermoplasty is an option for your asthma. View the video through ABC World News.